You want to experience a comfortable wine tasting? Have some of the best regional wines together with your guests? Here is the place to be. Weinfactum Bad Cannstatt is the only winemaker association with the famous Cannstatter Zuckerle. This is a high angle vineyard which is bearing outstanding wines. They are vinified and aged masterly in the associations cellar. The view over Bad Cannstatt up the hill where the winepress is located is really amazing. Listen to entertaining und interesting stories about the town during the wine tasting. Of course you will also learn a lot about the wines and how they are manufactured. Many of them are good to tell during a cellar tour. If you wish you can order a traditional swabian dinner with bread, cheese an sausage or another catering depending on your taste and your budget. The tasting can also take place somewhere else, e.g. in a restaurant or at your own location. You can combine it also with a slide show or a guided tour. 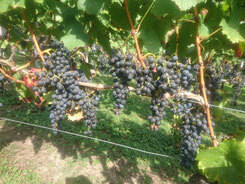 You are interested in wine tasting in Bad Cannstatt? Here you find the conditions and the inquiry possibilities.